Get a price estimate online. Or simply fill out our online form for a contact request. Shelving Concepts is a privately held company in business since 1987. Founded by Tom Amoruso, the company has grown into one of the Houston Texas top 100 small businesses. Tom's background in installation and sales of office filing systems, warehouse pallet rack, mobile filing and storage systems, industrial metal shelving, cantilever rack has helped the company increase sales every year. Tom still personally oversees each sale! We provide a variety of shelving and racking products for a variety of applications. Below are some of our most popular. If you have any questions at all, don't hestitate to contact us. Warehouse pallet rack is used for bulk storage in warehousing and manufacturing. We stock many sizes and specialize in used uprights, crossbeams, and wire decking. Our services include installation of pallet rack as well as moving complete systems to new locations. We offer free consultation and have CAD drawing layouts available. Learn more about our warehouse / storage solutions. 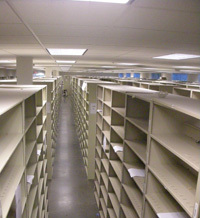 We are one of the top providers of used L&T file shelving. From single entry to double entry we stock and install filing systems for most any medical or business system need. We are one of few dealers that offer used mobile filing systems. From sales to teardown and moving of these systems we can provide a turnkey service. Learn more about our filing systems. Wide span shelving is used extensively for archive storage, it has many practical uses for storage. Stronger than regular metal shelving, it can be configured to fit most any size or capacity. Particle board is normally used for the shelf levels. Learn more about our widespan shelving. Industrial Metal Shelving is most often used for parts storage industrial metal shelving is available in many sizes. Used metal shelving is one of our specialties. Learn more about industrial metal shelving. Cantilever rack is used for storage of long or odd shaped materials. Typically uses a 12" or 16" tower in rows of 3 with several sets of steel arms attached to the tower for horizontal storage of long materials such as pipe. 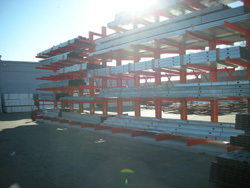 Learn more about cantilever racking. We also offer services such as file moving, shelf level adjustment when moving from one type of filing system to another. Please call on us at (713) 957-1111 today for all of your filing and Houston material storage needs!